I already analyzed and did troubleshooting for so many hours. My state is in minimum confused and probably desperated now. I am an early adaptor of Turris Omnia. My goal is two support apporx 8 5 GHZ Clients with good data rates and approx 15 IoT devices in 2.4 GHz with lower data rates but in a wider area. At first I started with the Wifi-Version with the two integrated cards “WLE900VX + WLE200N2”. From day one I wasn’t happy with the performance + range. I read a post from @Tom here in the forum called: “High-performance configuration”. I switched the 2.4 GHZ and replaced it with the version “Mikrotik R11e-2HPnD” (ath9k). Good decision. I am quiet happy with it. I changed the 5 GHz card with a Apple AirPort AR5BXB112 card. This one works with the ath9k driver. The card was quiet stable but I never got more performance as approx 30-40 Mbit/s (yes, Mbit/s). So I took the decision to buy the more expensive card which Tom recommended: Mikrotik R11e-5HacT (chipset: QCA9880). Since yesterday I am fighting with the configuration - I changed the firmware “ath10k-firmware-qca988x-ct” with “ath10k-firmware-qca988x” and vice versa. I checked (http://www.candelatech.com/downloads/) and (https://wireless.wiki.kernel.org/en/users/Drivers/ath10k/firmware) two get other firmware releases. But every time the same situation - I just get approx 20 - 30 Mbit/s (tested with many different clients with iperf, all the same result). What is going wrong here? I have good SNR and checked the plugs of the RP-SMA, MMCX plugs etc. No luck. Please can someone give me a hint what can be the issue - maybe someone with the same hw-config can tell me which driver, firmware and config he or she is using? Any help is really appreciated. is the dmesg output (see below) really ok? Which is the recommended firmware? (I already deleted and modified the supported rates and basic rates - no change). Try change bit rate with “iw dev wlan0 set bitrates legacy-5 ht-mcs-5 8 vht-mcs-5” -> no change. Well are you sure you did not damaged diplexers and connectors when exchanging and trying the cards ? It is very fragile parts. The wires are not actually wires but waveguides so if you bend it to fracture it could be the problem. Well I am not sure but I changed it very cautious. Which diplexers and connectros do you mean exactly - on the card or on the board? Ah, you mean the signal-divider. No I do not use them any more. Regarding the bit rate (6 Mbit/s) on ath10k: as @adminX pointed out in a few posts, it seems to be the normal state becau se the hardware/firmware does not report the actual rate to the OS kernel (adminX: “The ath10k run this in firmware and does not notify the kernel of the used transmit rate.”). Has someone an idea why there is a Peer TX rate of 24000? In this network are no Stations with lower RX rates than 54000. I don’t know what is going here. I am currently thinking to give up but I invested so much time and money here. Sad. I am so far away from a high performance configuration. I switched the firmware one more time: I am now on the newest candela nc use level. This time the bitrate is at 54000 and I get slightly better performance. All of the stations are 11n or 11ac capable. The bitrate is not getting modified on use. If no one ist interested or can’t help: does someone has possibly an advise, where I can ask for more help? At the moment I am thinking of selling my Mikrotik card and switch to my old wifi solution. Just a side note: I’ve got the same situation with the stock WLE900VX card. Just for you to know. We tried to use candelatech drivers about a year ago because users complained that our wifi is under performed. Everything seemed fine, our tests shown promise. But when we deployed it to production it all went to s***. Some users call it now wifigate. So our experience is that those drives has better performance but has some severe problems with stability. Of course it was more than one year ago so situation could change. But of course you are free to continue in your tests. We had little bit PR nightmare on our hands so we reverted as fast as possible and never went back. So we haven’t put up too much manpower to debugging what was going on. So there is chance that you might found out cause of those problems. Thanks for the information cynerd. I did not recognize stability problems. But even if my environment is quiet divers it is not comparable to real world. At the moment I revert back to the standard drivers. Candeltech performs slightly better but this is not my main issue. But I would be glad if I could help others. There are users in the forum like @flo which have a similar test environment like me but totally different performance metrics. I tried different pigtails, antennas and cards. I do not need the last Mbit/s to get an top rating in comparison to other vendors or projects. I just want rational numbers. I see that you get other bit rates. And you have connected the card to “0000:01:00.0”. Mine is connected to “0000:02:00.0”. I can’t imagine that this is an issue but maybe I switch my cards. For all clients in 11an / 11ac I only get a TX Rate of 54000. I do not understand why. I only know of this issue, if there are stations in the same Band, which publish lower data rates, so that the whole system will allign to these rates. 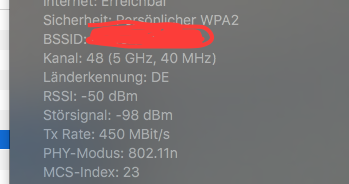 But I only have 11n/11ac clients in this band. This is really frustrating. Is really no one able or willing to help? I know that I seem to be alone with this issue but here are so many experts - is the only option to go back to my old solution and sell my Omnia?